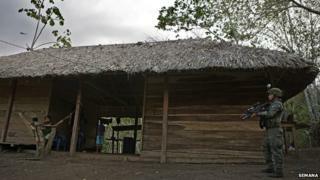 Widescreen TV sets hooked up to satellite dishes, expensive drinks and perfumes - these are just some of the luxury items Colombian police have found in huts in the otherwise poor rural area of Uraba, in western Colombia. The huts, and the luxury items inside, belong to Dairo Antonio Usuga David, better known as Otoniel, one of the most wanted men in Colombia. Currently some 1,200 members of the security forces are chasing the elusive gang leader. That is more than double the 500 who hunted Pablo Escobar, the drug lord who controlled the infamous cocaine cartel of the same name. Otoniel runs the Usuga clan, a drug gang that has its powerbase in the Uraba region of Colombia, but whose network extends across the country and beyond. Members of the gang have been arrested as far away as Argentina, Brazil, Honduras, Peru and Spain. The US Department of State describes it as a "heavily armed, extremely violent criminal organisation". It is offering up to $5m (£3.4m) for information leading to Otoniel's arrest. Otoniel has been in charge since his brother, Juan de Dios, was killed on 1 January 2012 when police raided his New Year's Eve party. The gang is first and foremost engaged in drug trafficking, but it has also been accused of extortion, illegal mining, forced disappearances and murder. It is very much a family business. Otoniel's partner, Blanca Senobia Madrid Benjumea, was in charge of the group's finances until her capture last month. His nephew, Harlison Usuga, looked after the drug traffic routes north to Central America and liaised with Mexican drug cartels until he, too, was captured in February. Over the past five years, the security forces have captured a whopping 6,700 members of the group. But its leader has evaded them so far. Last month, they launched a massive and costly operation to catch the elusive gang leader. Sources linked to the operation say $225,000 was spent on tracking down Otoniel in the first 25 days of the hunt. The people tasked with arresting him have been given clear orders from President Juan Manuel Santos and Defence Minister Juan Carlos Pinzon: Do not leave Uraba until you have caught Otoniel and have dismantled the whole clan. So far, the security forces have seized 5.5 tonnes of cocaine, and destroyed a number of coca crops and laboratories that turn leaves into cocaine. But they have yet to find Otoniel. His uncanny ability to dodge the security forces is partly due to his family's close ties to the region. Otoniel was born in Uraba and knows the region like the back of his hand. Most importantly, through threats and intimidation he has gained almost total control over the local community. When he called on locals to down tools to mark his brother's death at the hand of the police, the region came to a standstill for several days. When people in the region hear Otoniel's name mentioned, they react with fear. It is hard for the security forces to gain people's trust here, and it is something they have not yet fully managed. Moreover, Otoniel uses a variety of tricks to evade the police. He has trained dogs to alert him to anyone approaching his hide-outs. Police recently managed to catch one of his guard dogs and have trained him to go after Otoniel's. Oto, as police have called the poacher turned hunter, is well acquainted with his former master's smell and is considered a superb addition to the team tracking him down. The police have come close to Otoniel several times, finding in a number of hide-outs the distinctive orthopaedic mattresses he uses to ease back pain from a herniated disk. They hope their search will soon yield results and that they will be able to send Otoniel to the confines of a high-security jail where he is unlikely to enjoy such comforts.